A highly prized sky-blue precious stone, frequently mentioned in the Old Testament and Apocrypha (Ex. xxiv. 10, xxviii. 18, xxxix. 11; Job xxviii. 6, 16; Cant. v. 14; Lam. iv. 7; Isa. liv. 11; Ezek. i. 26, x. 1, xxviii. 13; Tobit xiii. 20). It is doubtful whether Job xxviii. 6 is correctly translated "it hath dust of gold." The ancients, in any case, did not mean by "sapphire" the stone which is now known under that name, but the so-called lapis lazuli, in which are interspersed many pyrites that glitter like gold against the blue background. The sapphire was highly prized by the Babylonians and Egyptians also. It was found in the mines of Upper Egypt (comp. Job l.c.). In the Old Testament the sapphire is enumerated among the stones on the breastplate of the high priest (Ex. xxviii. 18, xxxix. 11). 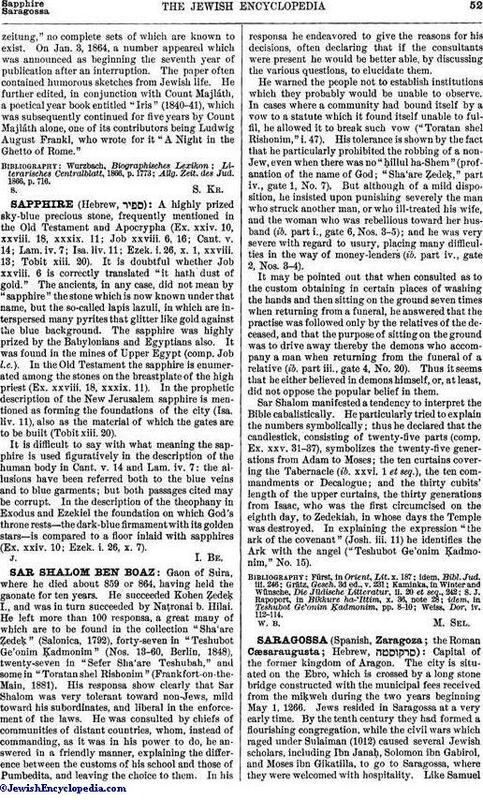 In the prophetic description of the New Jerusalem sapphire is mentioned as forming the foundations of the city (Isa. liv. 11), also as the material of which the gates are to be built (Tobit xiii. 20). It is difficult to say with what meaning the sapphire is used figuratively in the description of the human body in Cant. v. 14 and Lam. iv. 7: the allusions have been referred both to the blue veins and to blue garments; but both passages cited may be corrupt. In the description of the theophany in Exodus and Ezekiel the foundation on which God's throne rests—the dark-blue firmament with its golden stars—is compared to a floor inlaid with sapphires (Ex. xxiv. 10; Ezek. i. 26, x. 7).